A few months ago I was contacted by a representative of a site called cajungrocer.com. He offered to send us some Cajun treats if we would do a bit of a write-up on their products. Well, what else could I say but “Hell YEAH!”. We had our choice to sample crayfish, turducken or boudin. It wasn’t crayfish season so we mutually decided that wasn’t a good idea and the idea of “roadtesting” a turducken (which I honestly still don’t understand the purpose of… sorry if you’re a fan) skeeved me out and boudin is right up our alley so we settled on sampling that. I was hoping to have this review done much earlier than now but when I explain to you why it took almost 2 months to taste-test, you’ll probably understand why. A week after giving the “hell YEAH” go-ahead to the cajungrocer.com rep I received a knock at the door – it was a UPS man holding a large styrofoam cooler. Not a ‘holds a six pack’ size cooler, but a giant one. As ripped the protective tape off and lifted the cooler’s lid, my heart leaped and my stomach grumbled. Inside was not one, not two, NOT THREE but FIVE different types of boudin (not to mention a crawfish appetizer we have yet to try!). So I hope now you can understand why we needed to wait until now to write this product review. Too many snausages, too little time. Now, it is important to give you some background and history on Cajun Boudin – not to be confused with the French version you may have tasted before. Both are technically a version of boudin blanc (or white sausage), but the French version is often made with a combo of pork (or chicken or veal) and pork/chicken/veal bit’s (ie: liver and heart) along with milk, cognac and spices, thus making it a bit softer and more delicate to handle. After the French Acadians were forced by the British to leave Nova Scotia in 1755, they headed south and ended up making their homes in the various bayous and back-country of Louisiana, specifically in the area which is now called Acadiana or Cajun Country. 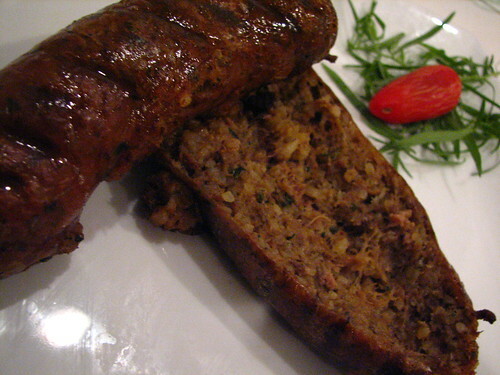 Cajun boudin is obviously related to the French version but the recipe changed a bit to represent what was available and plentiful in their new land – pork and those lovely hog bits, cayenne pepper and rice – all stuffed into the hog’s intestines. These Cajun boudin recipes have been passed down from generation to generation since and they are not all created equally. The center of Cajun Country in Acadiana is the town of Lafayette (see map below) and, supposedly, if you go there, you’ll see plenty of signs pointing you to the many, many places that sell boudin. It could be a restaurant, a guy on the side of the road or a place near a gas station but they are everywhere. And, according to my intense research, locals could give two flying pigs less if they are eating their boudin from a guy in a gas station or off some fine china at a nice restaurant – if it’s good, they’ll eat it. And again, according to research, the Cajuns call a Dr. Pepper and a link of boudin a Cajun Breakfast. Nothing screams healthy breakfast like a visit from the “Doctor” in the morning! 1. Do you like it wet or dry? 2. Do you like it spicy or mild? 3. How about chunky insides or mashed? 4. Do you like it with liver or without? 5. Do you want more meat or more rice? The thing is, you can think about these questions while eating a boudin but you’re not going to be asked them by your boudin seller! There are various combos of all of these types depending on the family recipe. I think I’d like mine dry, spicy, chunky, with liver and more meat. You? One interesting fact is that boudin is usually eaten as finger food and often thought of as a Cajuns version of fast food – eaten either by biting directly into the sausage or by squeezing the insides of the boudin right into your mouth. Grilling boudin is just starting to gain popularity in Cajun Country but usually it is stewed or braised. Besides being served with a Dr. Pepper in the morning, it is also often served with pork cracklins (fried pig skin), saltine crackers, hot sauce and beer – this sounds like my type of meal. Boudin can be put between two slices of white bread for a sandwich, in an omelette or made into boudin balls (deep fried boudin). 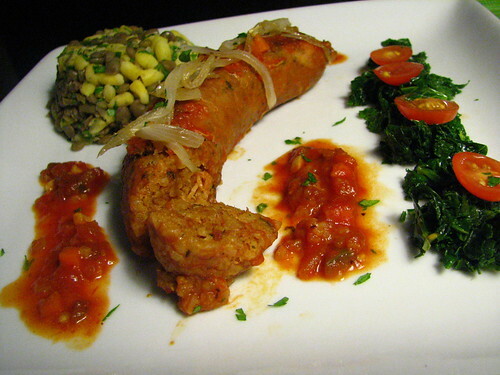 We decided to eat the pork boudin grilled with some spicy mustard and the alligator boudin over yellow hominy and lentils and paired it with a sweet and spicy tomato sauce. Even though we were in Brooklyn, I thought the boudin that cajungrocer.com sent to us was fabulous – full of flavor and perfectly spiced. Eating the Cajun boudin made me wish that I could experience not just the food of Louisiana, but the culture surrounding the food. Luckily, we still have a huge pork boudin with pork cracklin’ left to eat and, when we do, I’ll be throwing on some Satchmo, drinking some cold Abita (if I can find some) or a Dr. Pepper and dreaming I was in Lafayette. In fact, if you are every heading to Lafayette, Louisiana, check out boudinlink.com for reviews and an interactive map to find some of the best boudin around. 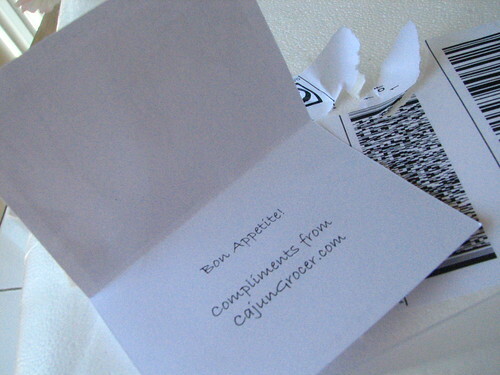 Thank you, again, cajungrocer.com – we highly, highly recommend your services and your delicious, authentic products. Fabada: A Mortal and Corporal Sin – But Worth It! Oooh, I am so jealous! I’ve never eaten boudin, but I’ve heard about it. It sounds wonderful and your versions look fab! I’ glad you both enjoyed it. Wow! Here I think I am a big shot because I got some free pastrami sandwiches and some cocktails for writing about the places that are in my neighborhood! You get a huge styrofoam cooler full of Cajun treats! You should’ve had a boudin sausage tasting party! You lucked out in the product sampleing!CS would have loved to try out all those Boudin.I just had the french boudin noir for the first time and loved it. I would have tried Turducken. It seems so medieval. Great post as always and full of info. Hey, Susan!! You know what – I had only tried French boudin at a restaurant in San Franciso before this and now I’m in over my head in boudin! Not that I’m complaining. You can always go to cajungrocer.com and get one sent to you (wink wink). Stacey: You know what – you should consider yourself lucky for that! I think there are probably at least 50 food bloggers in Brooklyn so there ain’t no way anyone’s going to give me freebies here for writing about them. 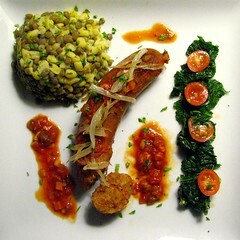 And, believe me, I wish I could have a boudin tasting party – I don’t think many of my friends would’ve even tried it. See, that’s why I need these great food bloggers to live closer to me! Courtney: We totally lucked out. I thought we’d get like 2 links of boudin so I really wanted to write a good post as a big thank you cause it all was so delish!! HA! Turducken – medieval. I guess you’ve got me there! Call me jealous–that looks awesome! Haha, sign me up for food swag–I would be in my glory if a package like this showed up at my door. I’ve never had boudin before, let alone such a variety. I absolutely love Cajun flavors (how can anyone not? ), so I’ll have to look into this some more. Oh, it all looks wonderful! There’s a place near here that has boudin as part of a charcuterie board, and it’s simply delicious. I’ve only ever had boudin “balls” (heh) on a po’boy in Nawlins. Which is probably to say it was neither traditional boudin nor po’boy. However! It was delicious with fried pickles. You’re lucky, I only get contacted by people who want me to plug their website (sans bribe). As if. Oh, what fun. Yet another food we’ve never tried in its authentic form. I’m glad you guys had a blast, and thanks for teaching us about all the cool “points to consider”. I kind of use that criteria for kielbasa to an extent. Right there with you on the Turducken thing. I do a lot of work in Southern Louisiana (don’t ask) and have been to Lafayette. Wonderful people and the food is as good as you described. Great post! Hey how absolutely fun and exciting however, I would have gone for the turducken…it’s fun…IT IS, even if it doesn’t make sense. Thanks for the Boudin lesson. Very interesting. How do I like mine? Well, I’ll have to try them ALL first, then let you know. I made a turducken one thanksgiving. I thought it was going to be all meat, I did not like the stuffing between the layers. Sending thoughts and prayers to our friends in Louisiana with the hurricane approaching. Hola Chicos!!! Thanks so much for comming over to my bloggoversary party, I appreciate that! OH MY GOD THAT LOOKS SO GOOD!!! seriously, when the heck did I miss the making of the Snausages?? tear. cant wait too see what other fun foods you can sample…GREAT BLOG PEOPLE!! Ok I am creole from TX and my mom is from the Lafayette Louisiana area. I live in Hoboken now. I’m pregnant and craving boudin from back home like you wouldn’t believe. I’m definitly ordering some to have it delivered to my office. If anyone knows where I can buy some in the NJ/NYC area…please help me!!! Thank you so much for this blog. Hey! Cheers for dropping by! Your post about boudin is fascinating – I’m making French white boudin/pudding this week, a mix of bacon, veal and prunes mainly. It’s going to be heaps of fun!! I’m moving to NYC in two weeks time by the way! 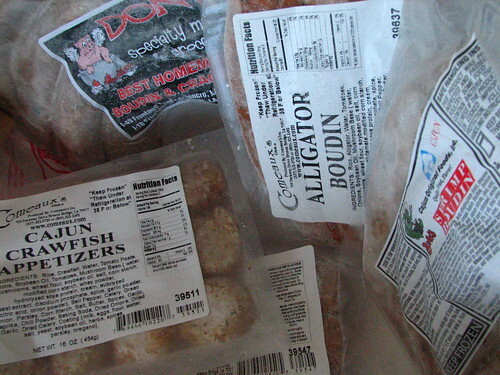 Being born in Lafayette, LA and raised on cajun food (including boudin of course…..). I must share the best boudin in LA is sold at a little gas station in Mowater, LA off of Hwy 13 just north of Crowley. And yes, Food and Wine magazine confirmed it was the best in one of their issues. It’s worth the drive – buy boxes and freeze it !!! Yummy. Frog leg Boudin, Crawfish Boudin, Apple Pork boudin.